Meet outside the main entrance at 2.30pm. Allow 2 hours for the guided tour including security checks. There are no public facilities on site. English Heritage members £5; non-EH members £6. Please let the Secretary know if planning to attend. 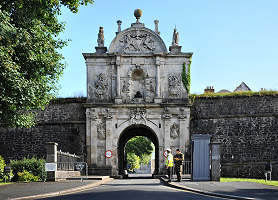 Entrance to the Royal Citadel, Plymouth.